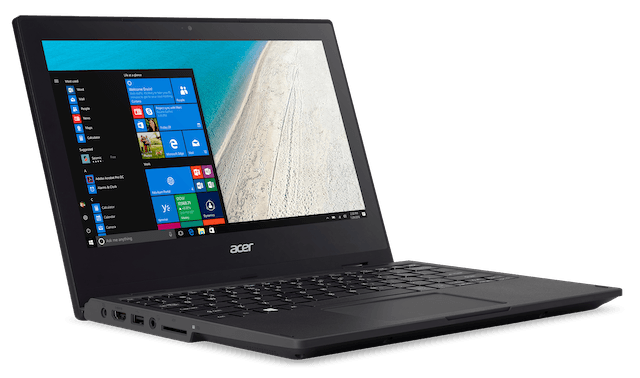 At the 2017 BETT show held in London last week, Acer has unveiled a fresh spin on 2-in-1 laptop with the TravelMate Spin B1. Running Windows 10 Pro, the new rugged convertible laptop targets the education market. The Spin B1 sports an 11.6-inch touch screen with either a full HD or HD-resolution. A Pentium processor powers the device and it comes with a shock-absorbing rubber frame for enhanced durability. Its keyboard can resist liquids with drainage channels under the keys to prevent water from drowning hardware. Its pressure-resistant screen is also designed to tolerate knocks without incurring cracks. As well as the chiclet keyboard, the Spin B1 comes with a precision touchpad and a stylus that is compatible with Windows Ink. On the connectivity side of things, the notebook features two USB 3.0 ports, one USB 2.0, an HDMI connector, dual-band 2×2 MIMO 802.11ac Wi-Fi, and Bluetooth 4.0 on the wireless front. It also comes with a 3.5mm headphone jack and an SD card reader. With battery life that can last for up to 13 hours, the Spin B1 is not your average notebook to boot. On top of the Windows 10 Pro operating system, Acer’s TeachSmart software also comes onboard to allow teachers and students to communicate more easily. Acer has squeezed a 360-degree hinge into the Spin B1, the first of the range to receive the Spin treatment. That means the notebook’s keyboard can fold back so that it lies parallel to the display. The keyboard can also serve as a stand to prop up the device in a tent mode to let you watch movies or presentations. However, these specs will vary according to region where the device will be shipped. Acer has yet to reveal pricing for the Spin B1, though the device is expected to hit store shelves in the U.S. and Canada in the second quarter of 2017.